Are you ready for the holidays? There's only 11 days until Christmas! Eeek! I am, so I'm participating in the Purrrfectly Giftastic Christmas Blog Hop to help spread some holiday cheer! It'll run from today until December 17th at 11:59 PM. I hope everyone is able to snag some great prizes from the fantastic list of bloggers participating this weekend! I'm offering up a $10 Amazon gift card as well as an ebook from me. What goodies do I have lurking in there you ask? Good question! Lost in a forest, Vera finds an elf who gives her a Christmas to remember. Traveling alone in Finland around Christmas isn't exactly what Vera Hayes had imagined she'd be doing. When her longtime boyfriend dumps her before the trip at the last minute, she decides to go anyways. However, she gets lost in a forest in Lapland and starts to panic until she runs into a magical man who looks suspiciously like an elf without the pointy ears. Pekka, one of Santa's elves, soothes away her worry and helps her find her way back to her cabin, giving her a Christmas Eve to remember. After her family was killed by a dark elf, mercenary Honora Butler's purpose is the disposal of wicked faeries, elves, and Unseelie beings, but she’ll find herself questioning her mission when she meets Brennan, a dark elf who doesn’t conform to what she believed his kind were like. Brennan O’Niall doesn’t know what it is about Honora that makes him crave her, but he wants to find out. However, when she’s charged with the murder of a friend, he’ll have to find out the truth and decide just how much she means to him. 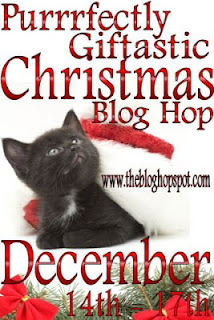 Visit the other Purrrfectly Giftastic Christmas Blog Hop sites here. I do enjoy Valentine's Day but my hubby never gets it. I love jewelry and he is really quite good at picking. I would want chocolates. LOL. Thanks for the giveaway. I am hoping for books of course and maybe some Amazon or Starbucks GC's so I can shop throughout the year at my leisure. My boyfriend and I are not exchanging gifts this year so I have given to a few families that are struggling this year. It has been a great feeling. Thanks so much for the amazing giveaway and being a part of the PURRRRfect hop! Health for my dad and lots of good books! I would love lot's of GC's for my Kindle Fire. I need a newer car! But I will only expect a new table lamp! ;) Merry Christmas! Thanks so much for participating in the hop! Well I would LOVE Clay Matthews from the Green Bay Packers, especially after that little dance he did today-yum!-but since that wont happen, books or giftcards to get books would be great! Thanks for joining in on the hop!! Books. I have a ton on my list. Books, books and...books! lol What an awesome hop!! And a fantastic giveaway! Thank you!! Happy holidays to you all! Best wishes and many blessings!